A highlight of every week is our field trip to the Museum: Rory goes with the Toddlers each Wednesday, and Edie goes with preschool on Thursday. We have the run of the place for the hour before it opens to the public. Of course I am always there with Edie and my class, and I love seeing her run around with her besties. But when I can, I run up and meet Rory for Museum time during my break. He never sees me coming so I get to sneak up and watch him with his friends in their natural habitat. Today I crawled up behind him. He had a wooden truck to drive over to the slide. It’s been weeks since I saw him without a vehicle in his hands, day or night. When he spotted me, he offered up a quick pucker and showed me his “La,” which is the closest we get to truck. 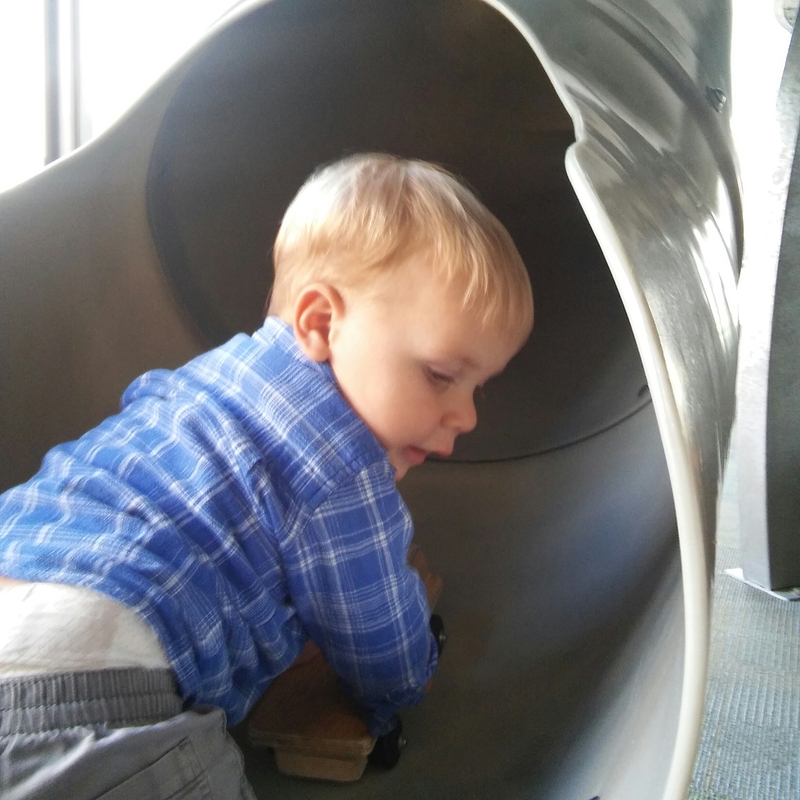 But he was kind of in the middle of some thing… He hauled off up the stairs, thumping the truck on every riser, and a moment later it whizzed out our the slide and bounced off the rubber landing pad. 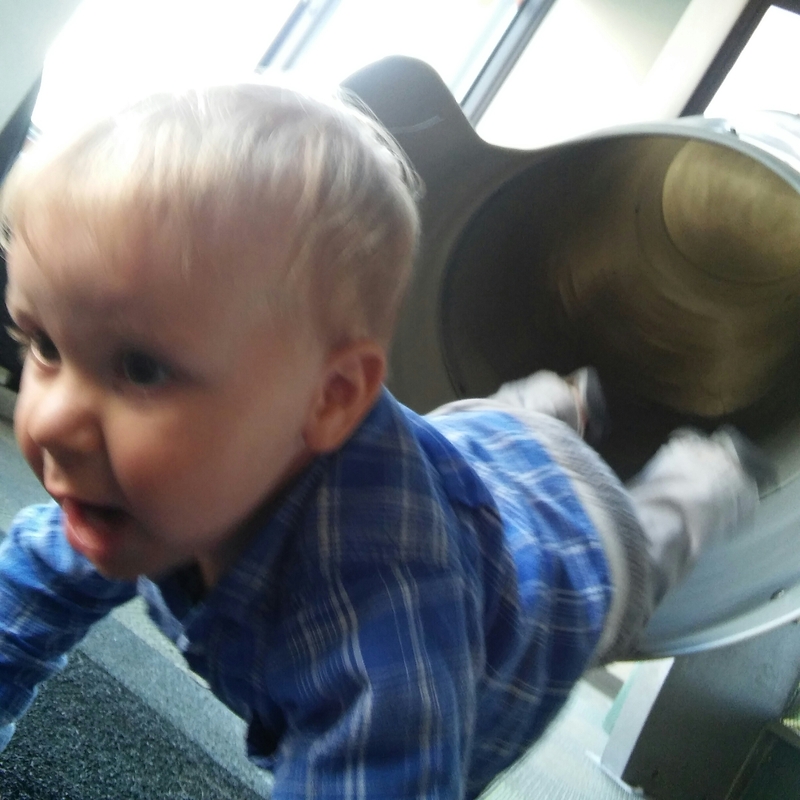 I peered up the slide and there he was, face first and ready to launch. In a flash he barreled out and uncrumpled, chattering and bubbling. He tore off after another little guy and waved, calling out “Bye bye!” over his shoulder. A big group of the kids from his class are moving up to the big toddlers room, replacing a group heading over for preschool. 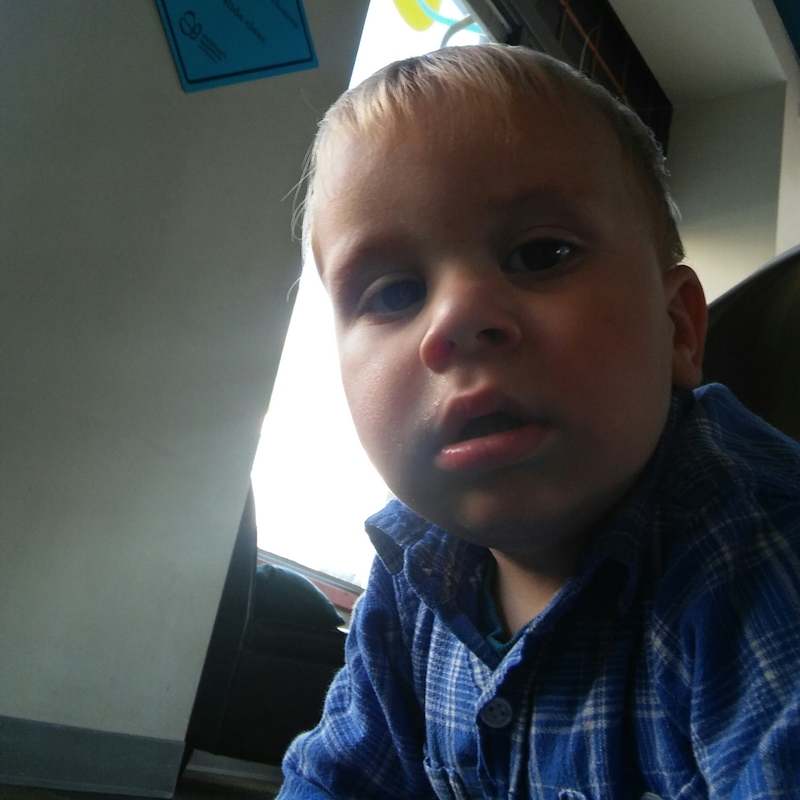 For a while he will be the big kid in the little room, but a few more months and he’ll join them and become the littlest big kid. I still wonder sometimes about some of the kids I worked with in Seattle, now so long ago they are probably looking down the barrel of middle school. I walked them from the one year room to two, walked them all up and down the block, and then walked them up to the three year room. They would definitely not recognize me now, or remember my name. Soon enough I’ll be taking Rory over to his second big transition, then third, then fourth, and then who knows? But here we are today. Right here.